In 2011 Hyundai introduced the hybrid version of its popular Sonata sedan, which has been around since 1988 itself – the longest running vehicle in the brand’s history that’s still around today. The Sonata Hybrid offers all of the same benefits that the regular Sonata does, with the added bonus of a hybrid powertrain. In other words, it’s a stylish sedan packed with surprisingly premium features and impressive specifications. In fact, it even offers a fairly surprising amount of power for a midsize hybrid sedan. It blends power and efficiency together, making it an excellent option for any driver shopping in the midsize sedan market, whether they were interested in a hybrid originally or not. For the 2018 model year it underwent a major overhaul and we’re quite excited with the all-new finished product. Speaking of the surprising power and impressive blend of efficiency, the 2018 Hyundai Sonata Hybrid is powered by a 2.0L 4-cylinder engine tethered to a lithium-ion battery and electric motor. This enables the Sonata Hybrid to generate 193 horsepower while still achieving 40 miles per gallon through the city and a whopping 46 mpg on the highway. For the 2018 model year, the Sonata Hybrid underwent a host of upgrades and enhancements, receiving a number of new design cues on the exterior and interior, as well as a plethora of new features. Automatic Emergency Braking and Lane Keep Assist are now available safety features while Blind Spot Detection, Rear Cross Traffic Alert and Lane Change Assist all come standard. Models equipped with the navigation system now come with a Qi wireless charging pad. There’s a USB charging port in the rear and the audio system has been upgrades. And we could go on and on. 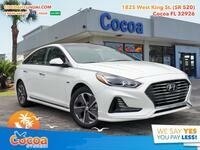 This is by far the strongest Hyundai Sonata Hybrid ever made, and if you’re interested in one for yourself be sure to get in touch with us right here at Cocoa Hyundai. Interested in a Hyundai Sonata Hybrid?